Want to learn how to read Japanese candlestick charts properly? Before we go further into this free price action course, we need to make sure we’re building on a good foundation. Many traders overlook the importance of shadows in price action trading. The shadows tell a story just as the open, close, and real body do. Not sure what some of these terms mean? Don’t worry. 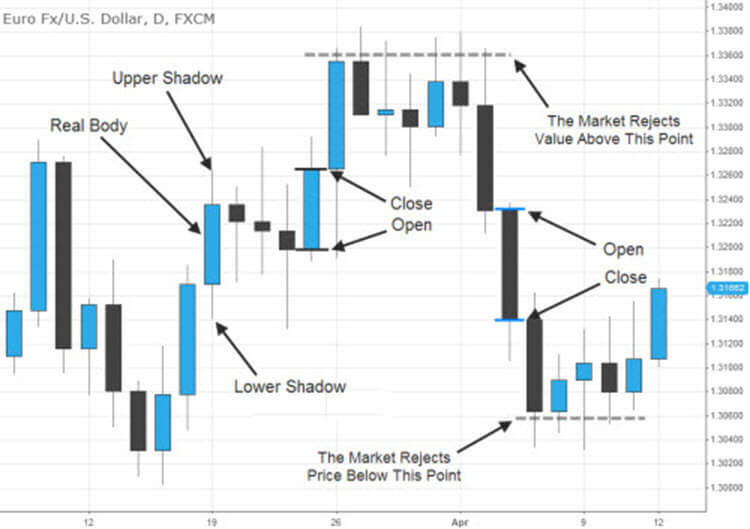 In this article, I’m going to explain the basics of reading Japanese candlestick charts, and why shadows are an important part of price action trading. In the image below, you can see an examples of what the real body, open, close, and shadows (or wicks) of Japanese candlesticks are. As you can see from the picture above, the shadows tell us a story just like the real bodies of these candles do. In this case, the shadows are showing us areas of support and resistance – or levels in price that the market is currently rejecting, among other things. Another example of how shadows play a determining role in price action trading is “long-tailed” candlestick formations. These formations, whether they are long-tailed dojis, morning/evening stars, hammers, shooting stars, etc…, are more telling when it comes to the direction of price. Example: The longer the tail is on a shooting star or hammer (also known as pin bars by some), the more likely it is that price will reverse direction. In the image above, you can see a spinning top followed by a long-tailed shooting star. 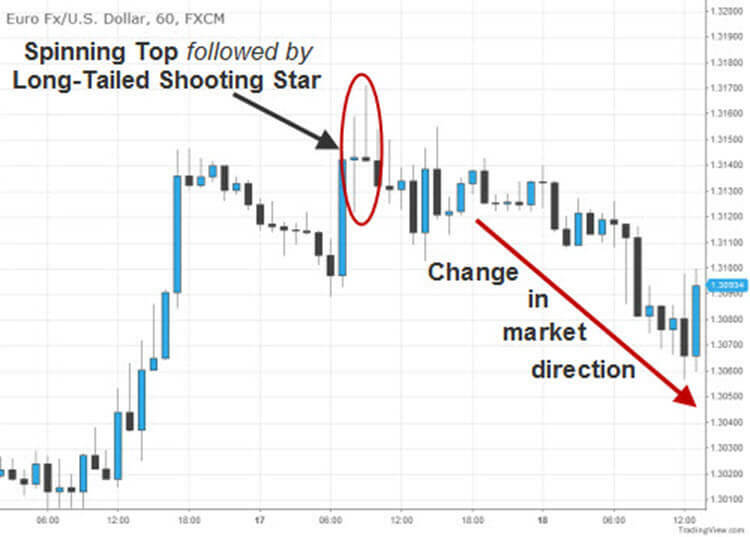 As the long tail (shadow) of our shooting star suggests, their is strong rejection of value above this point. The fact that this formation followed a spinning top makes it more potent, as spinning tops and dojis signify neutrality in the market. I learned most of these price action techniques from Steve Nison. I’ve tried a few price action courses before, including Nial Fuller’s price action system, but I highly recommend Steve Nison and his various candlestick trading courses. I’ve gone through several of them, and have learned a lot of price action trading techniques that I still use regularly. Steve Nison is credited with introducing the western world to candlestick charts. He is THE expert on price action. Steve Nison’s methods are excellent on their own. However, when combined with a good indicator based trading system, like Top Dog Trading or Infinite Prosperity, these techniques give you the ability to become a double threat in the market. The great thing about price action techniques is that you can add them to just about any current trading system or method. Price action is great for spotting entry and exit points, and can be dangerous in the hands of a good scalper. Now that you know the basics of how to read Japanese candlestick charts, we can move on to some more advanced stuff. For an example of how you can use price action with other trading strategies, check out my article on trading MACD divergence, or learn how to trade divergence on other indicators. Thanks for so much of knowledge and guidance . Can you provide some basic foundational knowledge on basics of mean reversion. Thanks for the comment, Kaushik Dana. Maybe I’ll write an article on the subject in the future. For now, I have nothing planned. It doesn’t come into play with the short-term technical trading that I usually do. Unless you’re talking about price coming back to a popular moving average, e.g., the 20 EMA, 50 EMA, etc. That is a valid technical trading technique that can be useful in the short-term, although it’s not one that I currently use. thank you so much your explanations are very simple to understand. Thanks for the kind words, oludare. I’m glad you found this tutorial useful. Is there any way to get your price action course as a PDF file.Would like to sit down and absorb it all, offline. Would definitely make a war chest to trade successfully. You could copy and paste the articles that you want to use in a Word document. Then save the document as a PDF file. As long as you’re doing that for your own personal use and not distributing the material, I have no problem with that. It would still be wise to back from time to time because I plan to eventually update almost all of those articles to be more comprehensive and to reflect the slight refinements in technique that I currently use in some cases. I also plan to add more candlestick patterns to the course in future. You can print direct to PDF files easily, in Chrome go to Print… -> Save to PDF (default). This way you can save contents and graphics, keep the sense of the Author. Thanks to your good website, I am beginner in trading and I excited about binary options system. Unfortunately my English is not very good. I spend my money and time in trading and I failed many times. I need help for learning about how use price action to get profit in binary options. I lost many things to learn how to trade and get profit and I tested many ways to do that. Can you help me about trading in binary options to get profit and success please? I need and I must to succeed. Please help me in this way. I am just a student that have many problems in my life and I should solve them alone. Please help me in this way if you can …. Hello, Mohammad. I do not trade binary options. I do have a free price action course on this website, though. Maybe that could be of some use to you.